Posted on Tue, Jan 10, 2012 : 1 p.m. 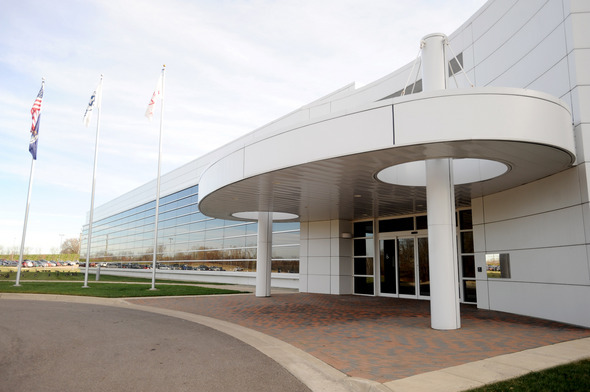 The Hyundai-Kia America Technical Center in Superior Township employs about 170 workers. The Hyundai-Kia America Technical Center in Superior Township plans to add 50 new jobs over the next three years in connection with a $15 million expansion. The expansion — which involves a new environmental chamber used for testing vehicles in extreme temperatures — is contingent upon the approval of state incentives later this month, a generally routine step at this stage. Hyundai’s expansion plans — first reported by AnnArbor.com in October — weren’t official until the company’s chairman signed off recently, officials said. "This investment ... in Michigan reinforces Hyundai and Kia's commitment to U.S. vehicle development and American jobs," said Won Suk Cho, president of the technical center, in a statement. "Investing in our locations, products and people is critical to Hyundai and Kia's ability to compete with the best in the business. Hyundai and Kia are committed to doing everything it takes to work with its partners, including the state of Michigan, to be competitive in the marketplace." Hyundai already employs about 170 workers at the facility, which conducts powertrain testing, calibration and some general engineering and design activities for Hyundai vehicles. For example, the tech center conducted some work on the redesigned Hyundai Elantra, which was named North American Car of the Year on Monday. Central to the company’s expansion is $2.5 million in capital to be provided by the Michigan Economic Development Corp.’s Michigan Strategic Fund. Those funds will be repaid over time using tax dollars from a Local Development Financing Authority (LDFA) recently established by the Superior Township Board of Trustees in consultation with economic development group Ann Arbor SPARK. SPARK CEO Paul Krutko said the Superior Township board agreed to abate 50 percent of the property taxes associated with Hyundai’s expansion and keep 25 percent for itself. The other 25 percent will be delivered to the Michigan Strategic Fund over time to repay the costs of an electrical system upgrade Hyundai desperately needed. Krutko described the funding structure as a creative model that meets Hyundai’s needs and could set the stage for similar economic development strategies throughout the state. Since opening its 200,000-square-foot technical center on Geddes Road in 2005, Hyundai has had numerous electrical problems at the facility. Because it uses sensitive testing equipment like a dynamometer, the facility is prone to electrical outages when current fluctuates — which also causes problems for the company’s network infrastructure. Hyundai had indicated that it would not launch an expansion without a reliable electrical system. To win Hyundai’s expansion, North Carolina offered free land and energy rebates from utility Duke Energy, while Alabama — where Hyundai’s U.S. manufacturing facility is based — also constructed an offer, Krutko said. Krutko said it was particularly important to win Hyundai’s expansion because it adds to a “very intense clustering of automobile R&D” in the Ann Arbor area. Although it’s important to simultaneously pursue the diversification of the Michigan economy, “it’s clear that we have, as a region, strengths and assets that you always want to continue to build on," Krutko said. The expansion comes during a period of intense growth for Hyundai, which is having a hard time keeping up with demand for its vehicles. The company’s retail sales rose 29 percent in 2011, compared to about 10 percent for the entire industry. Hyundai has also met with the Washtenaw Area Transportation Study group to discuss an expansion involving a test track of some kind, officials recently told AnnArbor.com. But a test track — which would require much more land than the 140 acres Hyundai's technical center owns — is not part of today's announcement. The company already performs some driving tests at the 3,850-acre Chrysler proving grounds in Chelsea. Wed, Jan 11, 2012 : 6:45 p.m. Wed, Jan 11, 2012 : 12:06 p.m.
Support our domestic automotive manufacturers. Wed, Jan 11, 2012 : 5:09 p.m. I think what JJ was eluding to was to support GM, Ford, and Chrysler (even though it is majority owned by Fiat). The money not only stays in the US, it is funnelled back to Michigan. A little testing facility and engineering office like Toyota and Hyundai have are a small part of the overall value chain of an automobile. The real dollars flow in through manufacturing and the spinoff effect it provides. GM, Ford, and Chrysler do all stages of the value chain right here in Michigan and spend exponentially more money than Hyundai and Toyota in this state. Wed, Jan 11, 2012 : 3:37 p.m. So if a company has significant engineering operations here in Michigan, and builds their cars in the US, are they domestic? Wed, Jan 11, 2012 : 11:39 a.m.
&quot;Since opening its 200,000-square-foot technical center on Geddes Road in 2005, Hyundai has had numerous electrical problems at the facility. Because it uses sensitive testing equipment like a dynamometer, the facility is prone to electrical outages when current fluctuates — which also causes problems for the company's network infrastructure.&quot; Yes Nathan, coincidentally many of the taxpaying voters in Superior Township have suffered outages since 2005 as well, with NO consideration by DTE other than &quot;A squirrel ate the wires&quot;. We, the voters, need to remember the lack of concern for the average taxpayer in the next township election. But then I forgot...corporations are people too. Wed, Jan 11, 2012 : 11:21 a.m.
Ann Arbor, MI: $15 million dollars. Similar expansion pattern in Flagstaff, Arizona. Wed, Jan 11, 2012 : 5:10 p.m. Wed, Jan 11, 2012 : 6:38 a.m. Wed, Jan 11, 2012 : 6:24 a.m.
On the topic of SPARK... does the Ann Arbor news or SPARK have any comment / counter-argument to this piece in the A2 Politico? <a href="http://www.a2politico.com/?p=11685" rel='nofollow'>http://www.a2politico.com/?p=11685</a> &quot;How The 1 Percent Create Jobs: Officials Dump Millions In Public Money Into Local Job Creation &amp; Exercise Little Oversight&quot; It would be nice to know what they think about it. Is an article like this one about Hyundai... the counter-argument to that other article? Wed, Jan 11, 2012 : 1:08 a.m.
For some reason my first post was deleted... Excuse me for telling the truth about hyundai, I know BECAUSE I WORKED THERE. Not sure what's wrong with saying that they use south korean's on work visa's as part of their total headcount, or that it was by far the worst place I have ever worked at. Regardless, I agree with the posts about how the hiring of ~ 50 people is pretty insignificant when you consider the tax breaks this place received. Wed, Jan 11, 2012 : 3:36 p.m.
Can you guys please elaborate a bit more on why the working environment was so bad? Sounds like cultural issues between the Asian management and American employees? Ditto. Worst place that I have ever worked at. Don't forget to bow to the supream ceo... and please avoid eye contact. My recommendation, buy American. Wed, Jan 11, 2012 : 1:26 a.m. I didn't understand why it disappeared. You were simply stated what you observed on the job there. Wed, Jan 11, 2012 : 12:15 a.m. Wed, Jan 11, 2012 : 1:54 p.m.
Maybe you can get $136k per employee ($30,000,000 / 220 jobs) like the Hyundia folks got. Tue, Jan 10, 2012 : 11:24 p.m. I hope they hire 50 people, and I hope they are local. If they are coming in temporarily, while that can help a bit (e.g., those &quot;temp&quot; workers still need to live somewhere), it's not as big a boon. More importantly, this facility, which went up in a green space without enough utilities (i.e., the power problems they've had; would have opening in Ypsi or Canton on Michigan Ave, where it is more developed, killed them?) has never reached its job promises. When it opened in 2005, it supposedly was going to have 400 people. When/if these 50 people are hired, that will bring things to a whopping 220. <a href="http://www.michiganadvantage.org/Press-Releases/Granholm-Celebrates-Grand-Opening-of-Hyundai-Kia-Tech-Center-in-Superior-Township/" rel='nofollow'>http://www.michiganadvantage.org/Press-Releases/Granholm-Celebrates-Grand-Opening-of-Hyundai-Kia-Tech-Center-in-Superior-Township/</a> By 2017 (i.e., 5 years from now), Michigan and Pittsfield Twp will have spent/forgone over $30 million on these ~200 jobs. I know there's competition from Alabama and such, but does doling out all this money really pay off? Again, I hope they hire the 50 people, but the Hyundai Tech Centers of the world are not going to lead us to the employment promised land. Wed, Jan 11, 2012 : 12:17 a.m.
Tue, Jan 10, 2012 : 6:23 p.m. This report doesn't give enough detail regarding the economic advantages granted to Hundai as incentives to do their expansion here. &quot;Development&quot; is always being hyped and promoted along with a &quot;race to the bottom&quot; when it comes to local taxes and publicly funded infrastructure improvements. How many years will it be before the Hundai facility pays its' own way and contributes to the local tax base? In the meantime public funds subsidize very successful private enterprises, not necessarily the ones really needed for a sustainable future, especially since fossil fueled vehicles are helping to rapidly unbalance the planet's ecosystems. Tue, Jan 10, 2012 : 9:54 p.m.
Good post. Especially when the &quot;investment&quot; is marginal- only 1.5 percent of what Hyundai spent on their plants in Alabama and Georgia- and not having the spinoff effects of a manufacturing facility. Tue, Jan 10, 2012 : 6:44 p.m. Excellent post. No one seems to quantify the results of these tax breaks. They just pat themselves on the back for them. I would be interested to know how many Superior Township residents have been hired at the company. The folks I know who work there were brought in from another country. Tue, Jan 10, 2012 : 6:20 p.m.